Blossom the Possum is hungry when she wakes up, so she goes looking for something to eat. She finds a delicious plum and takes it back to her home, but she isn’t the only hungry bush animal that morning. With so many animals visiting looking for something to eat, will Blossom end up having anything left for herself? 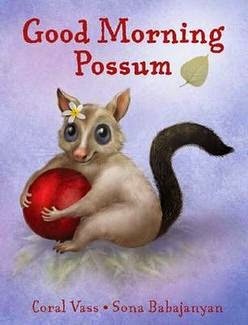 Good Morning Possum shares Blossom’s story in a pleasant rhythmic verse format that includes plenty of sound words as the various animal get Blossom’s attention and then nibble, nip, peck and chew on the plum she planned to have for breakfast. Children will enjoy the gorgeous illustrations of bush animals and the wonderful sounds of the story as the animals share Blossom’s plum. They will also be impressed that while Blossom is wonderfully generous with her friends, she is smart enough to be wary of the cunning Dingo, who is perhaps interested in something a little more substantial than fruit for his breakfast. A sweet story about sharing and friendship, Good Morning Possum is the first of two books by Australian author Coral Vass about Blossom, so make sure you also keep an eye out for Goodnight Possum to find out how Blossom and her friends settle at the end of the day.